Playing together since 2002, Guns 2 Roses are the number one Guns N Roses tribute in the country. Approved by various members of Guns N Roses, they even have the original GNR drummer Steven Adler playing with them from time to time! They have played to thousands throughout the UK, Europe and USA and this year played the North Pier at the Matthew Street Festival in Liverpool in front of 25,000 people. Hailing from London, Guns 2 Roses have played the same London clubs and venues that GNR did in the 80s, from the Marquee Club to the Mean Fiddler and Hard Rock Cafe in Hyde Park. They've also sold out the famous Cavern Club in Liverpool 2 nights in a row as well as many other venues and theatres that they have played nationwide. Totally focused on not only cloning the sound of GNR better than the rest, Guns 2 Roses are also mirror images to Axl and the boys, with stage performances down to the last detail. Playing many songs from Appetite For Destruction, GNR Lies and Use Your Illusion I and II and even the Spaghetti Incident? Guns 2 Roses sometimes even throw in the songs that GNR did live that never made it to an album. You want Guns N Roses? 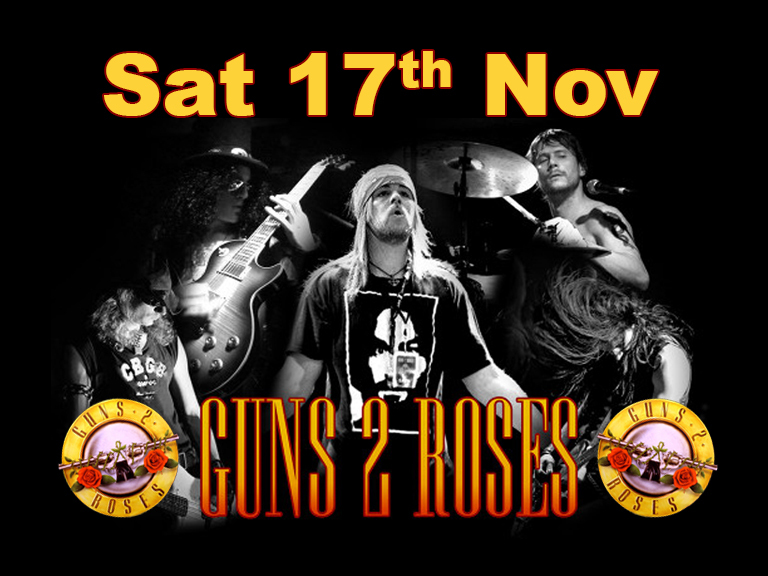 Go see Guns 2 Roses, the only tribute band to be approved by an original member of Guns N Roses.